I first encountered Edwin Smith’s photographs when an undergraduate. My supervisor at Cambridge, Dr John Newton, had one or two on the mantelpiece of his room at Clare. 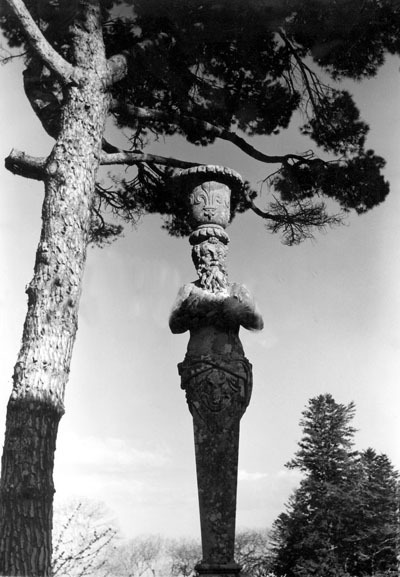 I am pretty sure he had a print (about 11×14 inches) of the ‘Caprarola, Villa Farnese: Terminal figure’. It occurs in The Wonders of Italy (1965), plate 93. Buying and displaying photographs was an unusual activity in 1966. Years later at the V & A Sir Roy Strong proposed an exhibition of Edwin’s work to mark the publication of a retrospective survey of his career by his widow Olive Cook in 1984. As Curator I started corresponding with Olive in August of that year. Someone had told me, quite wrongly, that she was ‘difficult’, so I must have written with anxious care—only to receive a typically effusive, kindly and cogent letter in reply. So began one of my most cherished friendships. I always loved visiting The Coach House at Saffron Walden where Olive looked as regal and sturdy as a piece in walrus ivory from the Lewis chess set in the British Museum. Olive, a scholarship girl, referred to Edwin’s upbringing in ‘very poor’ circumstances in Camden Town. She prided herself on having carved out a living as a freelance writer, as Edwin had as a much sought-after photographer who maintained many other visual interests. The Saturday Book in particular gave them a place in which to celebrate the robust, vivid, anonymous vernacular they liked to find, collect and think about. They loved cast-iron kitchen ranges, toy theatre prints, carved meerschaum pipes, rare English playing-cards, Japanese block-printed matchbox covers, fancifully designed and printed orange wrappers, Victorian glass paper-weights, the impossibly vivid illustrations of exotic plants published in such compilations as Dr R. J. Thornton’s Temple of Flora (1799-1805), pictures made of wool, shells, paper, glass, sand or seaweed, Bilston enamel boxes, hand-tied salmon flies, Edwardian postcards, tin-plate advertisements . . . They had a clear-eyed, unsentimental perception of such things—in fact, while exploring the Victorian vernacular, they were at the same time inventing the modern domestic interior. The distinguished photographer Tessa Traeger, who worked for Edwin when she left college in the 1950s, recalls the pattern of living established by Edwin and Olive at their Victorian terraced house in Swiss Cottage: sanded floors, white paint, and an abundance of house plants—a decorative scheme that was to become much imitated. Their aesthetics owed much to the spirited vernacular tradition they rediscovered and cherished, but also to the Arts and Crafts Movement with its regard for honest craft. Edwin’s work as a photographer is in a line that can be drawn from his Victorian predecessors Frederick Hollyer and Frederick H. Evans, through Eugene Atget to Walker Evans in the USA. Olive has written that he owned only one photographic book, the classic volume Atget: Photographe de Paris (1930). His copy, sumptuously bound in purple silk, was given to the V & A along with seventy of his photographs in 1985. Our friendship with Edwin Smith dates from the years immediately before his death. We had dug ourselves a swimming pool in the garden and we needed a changing-room. We envisaged a classical rotunda ; a temple – to the naiads ? – reflected in the water. The dome was the problem. How did we build it? Edwin showed us. He understood exactly what we were after and his plans for a pavilion were at once harmonious and totally practical. We were amazed. Here were our ideas transformed! Studying Edwin’s drawings, we saw that he had given us multum in parvo: far more than we had considered feasible. The work was put in hand and he visited us throughout the sunny summer of 1970; soothing and enthusing the builders ; watching over and photographing his creation as it took shape at the end of our pool. And our friendship flowered simultaneously – how could it fail to? – as we fell under the spell of his charm, his skill and his enthusiasm. What a rare person he was. What a privilege for us to have had this opportunity to know and to love him. From the catalogue produced to accompany the exhibition ‘Aspects of the Art of Edwin Smith’ at The Minories, Colchester in 1974. 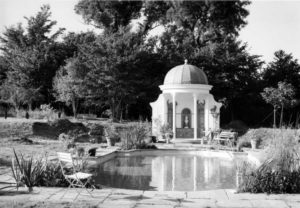 The photograph on the left shows the pavilion, designed by Edwin Smith and constructed for the Unwin family home. You can read the full story behind the remarkable discovery of this photograph here. Almost the last thing Edwin Smith did was to help us to make a home from a derelict old farmhouse, Wenden Hall, near Saffron Walden. We went to see him in his studio at the Coach House and asked him diffidently if he would practice his old profession for us. He agreed without hesitation. The house had started life as an aisled hall house of about 1400 and had become a farmhouse in the seventeenth century. It was in an unspeakable condition. But Edwin was not intimidated. For the most taciturn bricklayer his sparkle could always raise a smile; for us, his understanding and kindness never varied. He produced, as well as elegant plans, a stream of charming sketches prophesying minor aspects of life in the house; usually a child was peering round a baluster or disappearing through a doorway. He never saw his work completed. Of his many monuments we are lucky enough to have one around us. In attempting to pay tribute to Edwin Smith, I am faced with an unusual problem – I do not know which of his virtues to praise first. Edwin was artist, architect, toy-maker, photographer; and, in each creative sphere, he cast a light which illuminated some aspect of imagination, fantasy or tenderness. The miraculous way he could produce endless original drawings of untiring invention and ingenuity was in itself amazing; but this superb facility was only part of his genius, for these thousands of little drawings were backed by a world view. Walpole wrote that the world is a comedy to those who think and a tragedy to those who feel: Edwin both thought and felt, and the world for him was simultaneously tragedy and comedy. For instance, he could love a rogue, a fool or a genius for playing his part, for being so ridiculously a rogue, so sadly a fool, so nobly a genius. It was this comprehension which gives all his work another dimension apart from the instant appeal. It is both wit and wisdom. He was always a fine craftsman. He never believed that the shoddier and less co-ordinated a work of art, the more “life” : He knew life at a profounder level. So, in life, he could deal with almost anyone : rationalise the drunk in a pub, soothe the bogus medium, entertain the pundit, because he had so much to give and was not afraid of giving, a giving which indeed contributed to his own spirit. I suppose I am, among the survivors, one of his oldest friends. For me this is a matter of great pride. Nothing matters about a friend who has died except his essence. Not what he did or accomplished but what he was – the thing which changed the atmosphere of a house when he lived in it or a room when he entered it; which is expressed in a face and a bearing; is connected with his natural gifts but is above and beyond them and which, if he is an artist, becomes increasingly visible in his work. Edwin Smith had a greater range of capacities than anyone I have ever met and an extraordinary and rare general capacity – a kind of pass for a royal enclosure of skill where others are allowed in eventually only after laboriously qualifying, but which he was born with. As a result, while artistic success was no easier for him than any other practitioner in the arts, he never did anything badly. Everything was done intelligently, simply, effortlessly, or so it seemed to the observer. Most people who knew or worked with Edwin knew this. Everyone who worked with him knew him and he them; he was the easiest person to know and gave his friendship with the utmost spontaneity. I imagine that almost everyone must also have sensed what to me was Edwin – a shining innocence. The gentleness, the humour, the sensitiveness, the exasperation, the cheerful pessimism, his inability to trifle with artistic truth – all these were somehow secondary to innocence. Although he would have been one of the first to defend Eve’s taking the fruit of the tree of knowledge of good and evil (and I can easily hear him making a case for the serpent) really Edwin did not know any evil. This profound innocence is what he brought into a room. Much of it illuminates and distinguishes his work. His genial tolerance, and charity like that of some witty medieval saint, was surprisingly combined with the severity of his standards in matters of work. I only once saw him taking photographs: it was like looking at another man; his face wore a stern, rapt look, he preserved a total silence; his concentration reminded one of the top when it is spinning so hard, it appears to be motionless. Humanity and the devotion to work of an artist, I would think of as his leading characteristics, but his spirit seemed to embrace the whole of creation. Everyone knew of his love for animals. In his last months I had a letter from him in which he said he liked to put his arms round trees, hoping they felt for him something of what he felt for them. He felt so much and gave so much, to such effect, that he is giving it still. Not long after he and his wife had come to live in Saffron Walden, the town held a Festival, and Edwin was invited to collaborate in a production of the drama of Job in the Parish Church. Another distinguished artist, the composer, Dr. Gordon Jacob, had written special music for this, and Edwin’s job was to be responsible for an exhibition of paintings of the Creation, by local artists, which was to run, concurrently with the week of the production, round the walls of the church. This huge and daunting task – for St. Mary’s is one of the largest churches in Essex – was undertaken in a way at once wholehearted and single-minded. Not only single-minded but also practically single-handed. Familiar as Edwin was, architecturally and as painter and photographer, with churches, he knew from the start what he wanted, and preferred to do all the pre¬ liminary work on his own. This included the designing and actual making of one feature which, in the event, lent an inspired unity to the whole exhibition as nothing else could have done; a hand-painted “marble” wallpaper, based on the marble in Italian churches, which was to form a running backcloth to all the birds, beasts, flowers and fishes (which illustrate the great discourse in Job between God and the patriach) round the north, south and west walls of the church. When finally hung, this basically flesh-coloured wallpaper “all done by hand”, marvellously warmed the otherwise cold grey stone around it. Weeks of work went into making it – as indeed into the organization of the collection, selection and finally the hanging of the dozens of individual pictures to be shown against it. Through all the preparatory weeks, Edwin worked on his own, either at home in studio or garden, or else in the church. It was impossible not to feel a growing confidence in a craftsman so gentle, so sure of exactly what effect he wanted, so ceaselessly active – and all this for love! From a man with plenty of time on his hands, it would still have been generous; but from one who never stopped working and yet somehow managed to fit this extra job in, it was superhuman and an education to watch, in all its stages. I for one shall never forget it. For me the essence of Edwin Smith’s photographic work is the humanity which emanates from all his pictures. Houses, street scenes, sculpture – they are always chosen lovingly and seem, so magically, working in his landscapes, in some way to be projections of an inner image, rather than records. There is a quality in his photographs, a combination of rhythm, harmony and tonal values, which makes them resound in one’s memory. Working with him on his books was a joy, though the necessity to be selective could be painful. He took hundreds of pictures, which we spread on the floor, and had to choose from them the 100 or 150 which would be contained in our final book. It often seemed impossible to dispense with any of them ; but Olive brought to this task her scholarly approach, which helped us to discipline ourselves, so that a meaningful and vivid portrait of the subject at last emerged. “English Parish Churches” was the first of his books Thames and Hudson published (in 1954) and in 1957 two further books appeared, “English Cottages and Farmhouses” and “England”. They had a great international success, and many more followed in the course of the years. Olive accompanied Edwin on many of his travels and her knowledge and her enthusiasm were indispensable to him. Edwin was both a painter and a trained architect, and his knowing eye, his warm sense of humour, his deep romantic attachment were the creative forces which gave his photographs their unique personality, their expressive sparkle and what I can only call their eternal quality. Eva Neurath was one of the founders of Thames & Hudson. Edwin and Olive, Olive and Edwin: how can one think of one without the other? Almost the only time we ever saw Edwin separately was when he joined us in Venice to take photographs for a book, and gave us a chance of witnessing his extraordinary professionalism. He arrived with two small cameras and a huge list of subjects – some we thought very hard of access. But when he left a few days later he had somehow insinuated himself through every barrier and finished his task with brilliance. He was always a delightful participant in innocent, frivolous conspiracies. As when, finding that attendance at a Teatro Fenice first night required evening dress, he relished the triumph of walking past the doorman in an outfit somewhat resembling Mr. Salteena’s. There was never any fuss. He seemed, and indeed was, gentle, but there was a steely purpose under the silk. Anything he decided to do got done, and done in his own particular way, whether work, play or an act of kindness. His way was that of an artist of great wit, resource and distinction. The impact of his personality remains so strong that we still constantly find ourselves forgetting that he is dead. It was a happy day for me, personally and professionally, when thirty years or so ago I came across Edwin Smith. Today we know Edwin as a great architectural photographer, but in those days he seemed to specialise in what a later generation came to call pop art subjects – things seen in shop windows, woebegone plaster lions in Alexandra Park and so on. The full range and potential of his work only became evident to me when with Olive Cook he began to devise delightful features for “The Saturday Book”. Both prodigies, they were an editor’s dream. They did everything them¬ selves, layout included: you just sent the words to the printers and the pictures to the blockmakers. There were so many things to admire about Edwin. For my part I marvelled at the way his strong and impeccable aesthetic sense lived with his rare practicality. He knew how things worked. He was a trained architect. He combined “All the Phototricks” (a book of his still in print after more than thirty years) with an artist’s view of life. Like his wife, Olive, he disdained self-advertisement and was forever gentle, humane, and infinitely helpful to everyone. By the time he died he had achieved renown, and some affluence, as a photographer, yet one sensed that he longed to be accepted as a painter. It is not for me, who believes that painting ended with Renoir, to venture an opinion about Edwin or any other contemporary artist. All I know is that in everything he did he looked at things with the eye and the joy of the authentic artist. I met Edwin in 1944. He was my first English friend and in those days I was very proud that I had got one. Our friendship started almost at once and I was surprised at the ease and understanding that I found in Edwin’s company in spite of differences of background and my primitive English. This comfortable feeling was the result of Edwin’s openmindedness and quick intelligence. His knowledge on an enormous variety of subjects was incredible. I remember that often after fruitless questions to other people, “queries in English”, when sometimes they couldn’t even understand what I was asking about, I thought to myself, frustrated, “Edwin will know”. And indeed he always guessed immediately what I had in mind and the answer was ready. Those were the beginnings. And after – how many happy hours at our home in Rosecroft Avenue or at Olive’s and Edwin’s! How many occasions, suppers, children’s parties, or my first one-man show, etc! All these events were unthinkable to celebrate without Olive and Edwin. When an artist is alive and working we tend to think in terms of the future – what he will do next and what will be his future interests and development. When he is no more and only personal souvenirs and his work remain as the testimony of his personality and interests, there comes the need to assess them. Taking Edwin’s life from beginning to end, it looks incredibly logical – he was trained as an architect and finished as architect. But what happened between the beginning and the end! He was painter, etcher, designer, writer, photographer, architect and many other things which haven’t got ready names. In all these means of expression it was always felt Edwin’s personality. But what was this personality? To me it consisted of a warm, human, intime, peaceful attitude to the aspects of everyday life. Edwin was not interested in drama, grandiosity and big generalisations. He was drawn to small objects, often purposeless, where human caprice and phantasy found expression. In those objects he was able to find elements of strangeness and by contrast or association with others created striking, humorous effects, quite close to surrealism. He was one of the first to draw attention to the beauty and charm of Victorian ‘art populaire”. In present days this appreciation seems to us natural, but in the nineteen-forties it was almost a discovery. Intime detail of nature or interiors, the peaceful life of cats – those were Edwin’s inspirations. All Edwin’s creations were done with perfect knowledge of materials and technique and with precision of execution. As I mentioned before, Edwin was attracted by caprice, phantasy and the irrational. Is it not wonderful that in our era so dreary and purposeful Edwin was able to fulfil some of his dreams and to introduce all those tendencies into the medium of architecture – his last work included the building of follies!